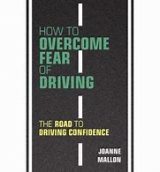 Since deciding to tackle my fear of driving, I had plucked up the courage to unlock the car and sit behind the wheel the night before (a baby-step recommended by Joanne Mallon in How to Overcome Fear of Driving). Even the act of picking up the car key had felt strange and, believing myself to be completely unqualified to even hold it in my hand, I had walked to the curb feeling like the world was watching me. I took my place in the driver’s seat, breathing in the faint familiar scent of my mother’s hand lotion, and quietly rested my shaky hands on the steering wheel. A fluttering of butterflies came to life in my stomach, settling down once they realised we weren’t going anywhere. It was a quiet evening and the street was still. With no engine rumbling or AC blasting, a surprising sense of calm filled the car. I broke the silence by fiddling with a few switches and levers, setting off the windscreen wipers and flicking on the headlights. I adjusted the seat and mirrors. The interior was spotlessly clean, with only a few remnants of my mother’s previous ownership to be found: a window scraper for icy days, a disused sat-nav holder, a neatly folded high-visibility vest. No cash (I checked). I found the car manual in the glove compartment and half-heartedly skimmed through a few pages. If you’re battling with a driving phobia, the thought of starting the car and driving to the end of the street feels like being asked by NASA to fly a space shuttle around the moon, with only a diagram drawn by your six-year-old nephew as instructions. I knew that if I had any chance of turning the key in the ignition, I would need to book refresher lessons with an instructor, which I was dreading. I persisted with the lessons and eventually booked my first ever test, failing it almost immediately by driving over the curb as I left the test centre. I started to learn to drive in Belgium where I grew up. My first instructor was a chain-smoker somewhere in his 40’s or 50’s (it’s all the same to a 17-year-old), who would pause the lessons at roadside cafés to buy me coffee and offer me cigarettes. Assuming we were stopping to discuss parking techniques or road signs, I was horrified when he told me how much he was going to miss me at the end of the course and that he would enjoy driving by my house to look for me. Thankfully, he had made no physical advances on me, but the atmosphere in the car had become bizarre and uncomfortable. Once I had clocked up the compulsory 20 hours of instruction that allowed me to drive unaccompanied for three months on a provisional license, I was eager to distance myself from this man and start enjoying my summer with Baby Charlie (the name I had inexplicably given to a small red Honda Civic). Unfortunately, I was a badly taught and inexperienced driver, who had become tense and anxious at the wheel in his unsettling presence. I was subsequently careless and jumpy driving Baby Charlie around, getting into bumps and scrapes on a regular basis and suffering tirades of abuse from other drivers. At the end of the summer I left home to study in the UK, leaving Baby Charlie behind. Now in my twenties and living in London, it seemed that despite living in a city with no real need for a car, everyone I knew had a driving license. I signed up with a local instructor who sported a similar look to Captain Birdseye but shared none of his friendliness. He adopted a ‘master and commander’ approach to teaching, barking orders and chastising me for rookie mistakes. I felt mortified on my first lesson when, having been taught to drive on the left, I instinctively stretched out my right arm to change gear and smacked my hand against the door. He let out a loud sigh, lit his pipe and called me a ‘silly girl’. I persisted with the lessons and eventually booked my first ever test, failing it almost immediately by driving over the curb as I left the test centre. Captain Birdseye hung up his driving gloves and promptly retired. My next attempt was a decade later, still in London, with an instructor who had posted the notice Nervous Drivers Welcome on his bland and boring website. My anxieties about driving had now been exacerbated by the devastating news of a friend’s fatal car accident. Panic attacks and nausea had become commonplace for me at the wheel, and I came to be afraid of other drivers as well as my own apparent inabilities to stay in control. I had hoped someone bland and boring would be the yin to my yang, but I found the detailed descriptions of his weekly meal planning (oven chips with everything) infuriating and distracting. On top of this, as an instructor he had very little patience, which brought his website branding into serious question. I booked another test and failed it, this time by carefully stopping outside the test centre at a red light which, as it turned out, wasn’t intended for my lane. An improvement on last time by about 45 seconds, not enough to convince me I had any hope of becoming a qualified driver. Back in the parked Polo on my quiet street, I silently congratulated myself for having at least persisted over the years, albeit sporadically. I reminded myself that not all instructors are as creepy, condescending or impatient as the ones I was unlucky enough to encounter. In fact, had I needed a piece of paper to prove that I was qualified to drive, I already had it. In an unbelievable turn of events a few years ago, I had finally passed my driving test in London with a clean score sheet, not even a minor fault (a result that had really annoyed my husband who, up until then, was the only one in the family to have held claim to that achievement). It had been thanks to a calm, patient and quiet driving instructor from Tottenham called Keith. ‘Let them fly,’ he’d say about other drivers who were eager to intimidate and overtake me. ‘Don’t speed up, slow down. Let them fly, if they want to!’ (he was unintentionally quite profound like that). His relaxed and unflappable nature was contagious and his preference for silence was fine by me. When it came to booking my test, he knew which test centre to pick at exactly what time. Luck was on my side, for once, as the examiner asked me to perform a turn in the road within five minutes of setting off to avoid a slow rubbish truck. With my preferred manoeuvre out of the way early on, the rest of the test felt calm and manageable. On that incredible day, the tears, the cards, the messages of congratulations, I felt I had finally defeated my nemesis. I hadn’t. Whilst researching this blog, I asked 20 friends if any of them had experienced inappropriate behaviour from a driving instructor. Eight of them told me that they had, two of them with more than one instructor, with reports ranging from lewd comments and knee fondling to physically grabbing their hands and slamming them onto the steering wheel. A recent report by the DVSA revealed that between April 2016 and March 2017, there were 109 investigations into instructor misconduct in the UK, which included ‘inappropriate sexual behaviour and other offences’. It’s safe to say that there are probably plenty more incidents that were never formally reported. The DVSA has pledged to crack down on such cases, but it’s up to learner drivers (younger students especially) to recognise the signs of unprofessional teaching and feel confident about speaking up or, at the very least, changing instructors. Perhaps in this current age of high-profile sexual misconduct allegations, today’s teenagers are more aware of what is unacceptable behaviour. I hope so.